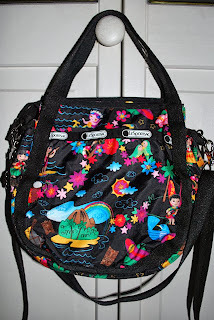 Picturing Disney: LeSportSac It's a Small World Polynesian Paradise Multi-Bag Review! 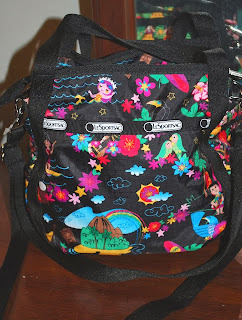 LeSportSac It's a Small World Polynesian Paradise Multi-Bag Review! I am a HUGE LeSportSac fan and have been for years. Of the course of the last 18 months or so Disney has teamed up with this amazing brand featuring seasonal patterns inspired by the fabulous Mary Blair's It's a Small World art. Each different pattern featured a different country featured in this fun ride! The last pattern in the collection is by FAR my favorite yet: Polynesian Paradise! When LeSportSac sent me and my writers some bags to review (and keep your eyes peeled since they also sent some great bags for an amazing giveaway coming up soon) I nearly cried I was so psyched! Instead of just giving you a quote or two about each bag I have reviewed two of them and each writer another! Since after you see the pattern I know you will want to purchase your own, now we can help you decide which style is right for you! I have always wanted a full size EveryGirl Tote from LeSportSac. I am a school teacher and the Social Studies office is a long walk from the wing my classroom is in so it is imperative I have a great bag, that is durable and easy to clean, with lots of compartments to stay organized. This bag was all that and more! It is beautiful (I get compliments everyday) and I love the attention to detail and zip closure on top (full picture above). When I filled my bag with all the things I usually carry around (file folders of worksheets, folder of paperwork for the SADD chapter I advise, books I am currently reading or that my Honors students are reading, pens, notepads, my cosmetic bag filled with toiletries and other necessities, cough drops, extra pencils and flashdrive and other trinkets) I found myself grabbing more stuff off of my desk to fill it up! When I finally was satisfied it still zipped up no problem and was easy to carry on my shoulder without feeling like I weighed down the bag. There are two inside slide pockets and a pouch with hidden pocket on the opposite side of the lining. The outside has two awesome side pockets. I was able to fit my umbrella and huge keychain on one side and plastic refill cup on the other! I love that I can be handsfree in the halls thanks to this fabulous bag! The pattern is a little different than the others but its fabulous (see picture below) and the lining inside is a great pink color! Additionally I was able to review another gorgeous bag: The Small Veronica Hobo! This bag has been something I've had my eye on since I first saw it but have never been able to pick one up! Its just the absolute perfect everyday bag! If you look at the first picture in this article you can see the way it falls perfect on your hip when you use as a crossbody bag! Whats fabulous is that when you shorten the strap it also works perfectly for a shoulder bag. The design is beautiful with just enough room for everything you need even if you carry a huge wallet like I do-- I filled the interior pouches with makeup and still had room for sunglasses, gum, wallet, keys, cell phone, work keys, lotion, and a few other trinkets. I love everything about this bag and I don't think I have recommended another bag I've owned as much as this one! Its got a great shape, adorable pattern, and is easy to wear with anything- plus its super easy to clean and lets me carry some magic with me every day! When I first opened the box containing my Classic Hobo I immediately loved it as it is exactly the same size as the bag I was currently using! It really is the perfect everyday bag. The size and space inside is just the right amount for anyone, really. And the print is colorful and vibrant while still being neutral. 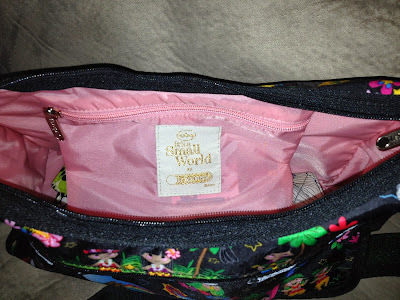 There is the large "main" zippered compartment with a smaller zippered pocket inside. 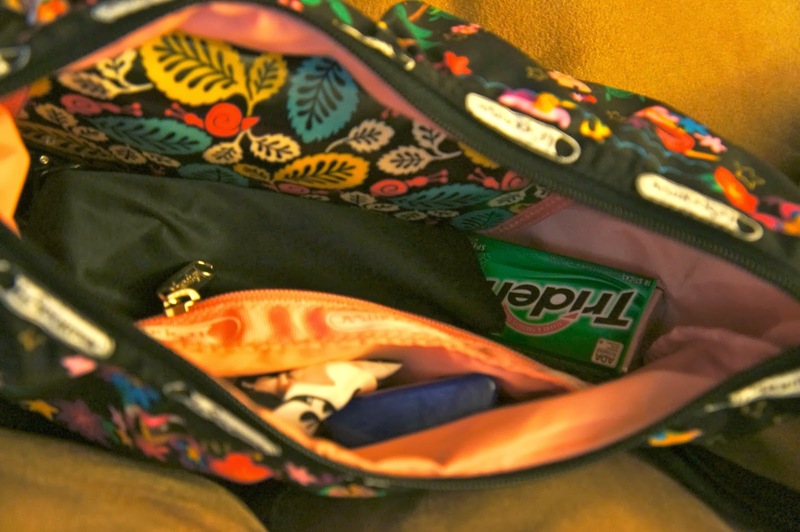 There are also two full length zippered pockets on both sides of the outside. The one thing I personally had to adjust to was finding a convenient place for my iPhone. My current bag had an outside open pocket that fit it perfectly. 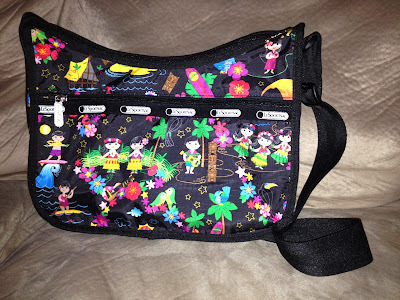 I need my iPhone at my fingertips constantly, so we'll see how the outside zippered compartment works for me (although knowing my phone is safely zippered away makes this a good choice in the Parks or when I am out and about). You could very easily make this a touring bag as well!! The main area would fit snacks, juice boxes, wallets, etc. 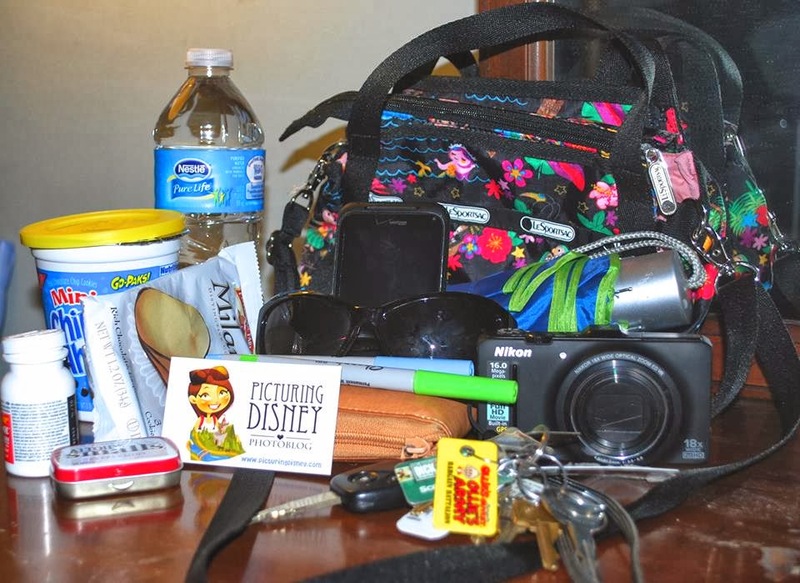 The outer pockets would be good to corral papers (think fast passes), receipts, or anything else you'd want handy. And again, wearing it cross body is extremely comfortable. It is no wonder that Lesportsac teamed up with Disney. Now that I have my Lesportsac bag – I am pretty sure that Lesportsac knows how Mary Poppin’s carpet bag was designed. I am not kidding. This bag is small (8x8.5x4"), but I can fit so much in it, that I am sure it’s lined with some kind of magic. (Not to mention how cute it is!, a Disney must!). Note photo #1 (cute right?). Notice photo #2 the bag is zipped closed. Not so unusual… until you view photo #3 That is what was in it! I usually carry a backpack! I am seriously never going on vacation without it! I get to carry a colorful, beautiful, Disney inspired bag and as small as it is, it is as functional as a bag twice it's size! When I found out about getting to try out the Small EveryGirl Tote from the LeSportSac bag line inspired by Disney's It's A Small World attraction, I was ecstatic. I've heard great things about these bags and was excited to try them out. It looks and feels durable. Not to forget how cute the patterns are (and it doesn't hurt that its inspired by the great Mary Blair). This bag is great for the every day and a nice touch to any outfit. What is the best part you ask? My husband can no longer call my bag ìthe bag of deathî (whatever went in, would never come out aliveî). Everything can be put away and found again. No more missing keys in this girl's future. As for size, this bag is 9 x 9.5 x 5.5 in. Taking this into consideration, I was really surprised to see how much actually fit into the bag. I was able to fit a change of clothes, wallet, cards, lip gloss, etc. It has two pockets, one on the inside and one on the outside. The inside pocket is the length of half the bag. The outside pocket is the length of bag and great for storing my keys. The quality of this bag is wonderful! Hope everyone loved the reviews! Keep your eyes here on Picturing Disney later this week for your chance to win a Deluxe Everyday Bag with Charm and Zip Closure Pouch OR a Rectangular Cosmetic Bag (no charm)! LeSportSac sent us these bags to review (as well as the bags for our upcoming giveaway)!